Sri City, April 4, 2017:- The Consul General in Hyderabad, Ms. Katherine Hadda visited Sri City. 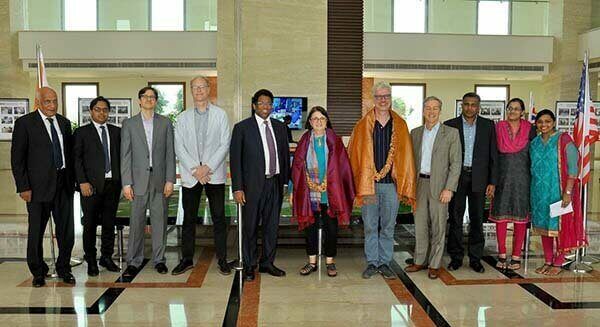 She was accompanied by Mr. John Fleming, Commercial Consul for South India and the US Consulate team from Hyderabad. Mr. Ravindra Sannareddy, Founder Managing Director extended a warm welcome and briefed her on the infrastructure, unique features and the brisk pace of development in Sri City. Welcoming the guests Mr. Ravindra Sannareddy mentioned that more than ten US companies, including the major brands like PepsiCo, Cadburys, Colgate Palmolive and Kellogg’s have set up their production units in Sri City. 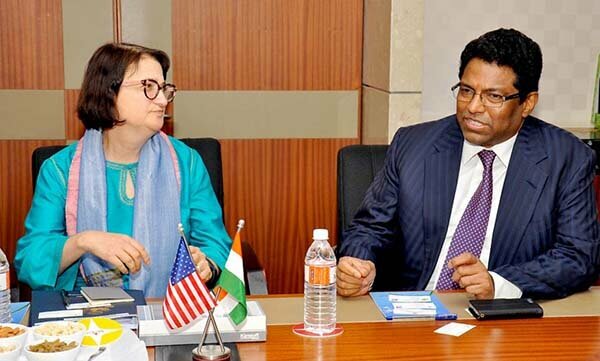 “As Consul General herself witnessed how American companies are thriving here, I am confident, her visit would pave way for some more American companies to investment in AP, particularly in Sri City,” he added. The intent of the visit was to see the new industrial city in person and have the first hand knowledge of the progress achieved. During the interaction, Ms. Katherine Hadda evinced keen interest and inquired on different aspects of Sri City. Following the briefing session, the Consul General visited the units of PepsiCo and Kellogg’s. She had a close glimpse of the production facilities and witnessed the works in progress. The Consul General had a meeting with the senior representatives of those companies.